So You Want to Play Piano and Sing? When you practice for singing, you want to learn the chords in the right hand instead of the left hand. The left hand will be playing the root and the fifth of the chords, but the root mostly. Basically, if you are playing a ballad, you will hold the chords in the right hand while playing the root (name of the chord) in the left hand. Add lots of pedal and you are good to go! Now playing up-tempo songs are a different story. You need to use rhythm patterns to liven up the song. One that I like to use is pulsing in the right hand. This means that you play a chord on every beat of the measure. The left hand plays the following pattern - dotted quarter note followed by an eighth note, then repeat. The two hands match up really well. I use this for a moderately up tempo song. Works really well with R & B songs! Now is the time to add the voice. Only after you can play your song, not before. You've got to drill your piano chops first. And when you are playing, be cautious about playing too loudly. You don't want to cover up your voice. Many singers forget to breath properly when they play. Another challenge is not looking at your fingers too much. What happens then? No one can hear or see you. This is why the piano chops need to become second-nature. How do you make that happen? By playing and practicing and using songs that are not difficult. By that I mean, choose songs that have at the most, 5 chords in them. That way you will not be overwhelmed technically. Most of all, have a ball. 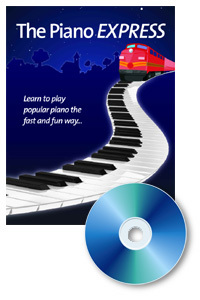 If you want lots of Free Video Piano Lessons, be sure to sign up here for eNotes.